Intuitiveness: Automizy’s platform is intuitively designed so even the most novice user can quickly produce slick, effective campaigns with ease. Further investments to build an even more simple and visually recognizable user interface will be one of the key areas. Ingenuity: Automizy infuses ingenuity into every element of our software from visualized automation builders to artificial intelligence, making every marketer smarter and more productive. We will invest heavily in AI so marketers can enjoy the benefits of smarter decisions and campaigns. New AI-based solutions are coming in the next months. Insights: By taking the guesswork out, Automizy peels back marketing’s mysteries by providing clear, evidence-based, actionable insights and intelligence that improve marketing performance. We will double down on smart reporting and dashboards to generate more actionable insights for marketers. Our story started in 2014. The founding team previously built Protopmail, an old-school email marketing tool serving large volume senders in Central Europe. As the founder of Protopmail, I built the company from zero to market leader position in Hungary. Between 2010 and 2014 we experienced 100% YoY growth rate, but in 2014 we realized that the Hungarian and Central European market was too limited to sustain our growth rate. During 10 years of building Protopmail and spending thousands of hours with marketers, I slowly developed empathy toward them and their problems. I realized that a very little effort (one or two days of programming) invested by me could result in great satisfaction for them. This became a never-ending positive feedback loop and, like cocaine powers an addict, pushed me continuously to solve more and more problems for marketers. I was, effectively, hooked. The rest is history. This is how the landscape looked when we arrived in 2014. The global marketing technology landscape started to become very crowded. Just look at this picture below from Chief Martech! And the trend continues… the number of marketing automation tools on the market is growing exponentially. While vendors promise they will solve the core problems of the marketers, the sad truth is that the entry barrier for users is growing continuously. No single marketer, no matter how experienced, can keep pace with the change in the space. The mandatory initial knowledge for marketers is higher and higher as the marketing technology ecosystem continues to evolve. In their race to add ever-more valuable features to their platforms, marketing technology companies often lose sight of their users’ capacity to understand, much less master, the new features. Rather than making their platforms more and more simple and straightforward, many marketing technology companies add needless complexity to their platforms, causing a confluence of consternation and confusion. For marketers seeking to move quickly, initiate campaigns seamlessly, and measure results immediately, the feast of new features merely impedes their progress. Current marketing automation tools are too general. Lots of features mean a long learning curve. Vendors provide toolsets, not solutions. As a result, users have only two options: trial and error with a long learning curve or hiring senior marketing staff. Both options are problematic, especially for SMBs which have a limited marketing staff and budget. Even though there are dozens of excellent email marketing and marketing automation tools on the market, marketers face a lot of problems. Marketers are struggling with writing relevant, personalized content to the target audience day by day. Content marketing is the most time-consuming part of the strategy. You write blog posts, landing page copy, email copy, social media posts, push notification messages, and more. It takes tons of time and energy. And finally, you realize that this is not even the biggest problem. The biggest problem is if you can’t reach the target audience who will read your content and take the time to take a specific action in the buying cycle. Often, your time and energy are just wasted. In this new era of online marketing with feature-rich email marketing tools, marketers have a lot of tasks on their to-do lists, but less and less time for creating the strategy and thinking about high impact initiatives. Whether visible or not, marketers lost the control over their marketing strategy and became slaves of the tools they use. Often they cannot implement their strategy with the tool they have to use so they are forced to change their processes and compromise strategy. Technology currently does not really support and empower marketers, it pushes them into corners where they’re at the whim of others. We built Automizy’s culture around simplicity, agility, and transparency. We want to solve as many problems of marketers as we can with as low effort and number of features as we can. The Automizy platform is more intuitive, our processes are more ingenious and our insights are more informative to help marketing consultants and SMBs grow more profitably. We help companies make their content even more enticing to their target audience by leveraging AI with respect to the best subject line available for your emails. Far from complicated or overly-engineered, our automation and pre-created email templates save time so marketers can focus on content and the promotion. While we bootstrapped ourselves for the first several years and grew steadily to our current run-rate, it became clear that added investment would help us expand our footprint in both Europe and the U.S. and allow us to inject our brand of intuitive and insightful designs into the market. We’re especially excited by our AI elements which we think will have a meaningful and lasting impact on how marketers approach their daily work. 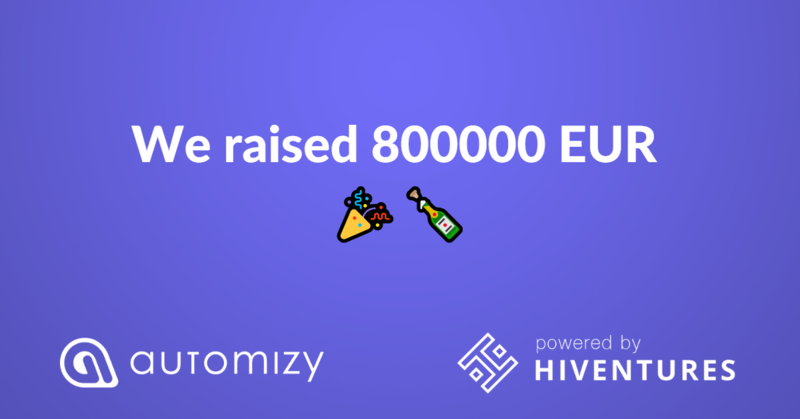 Now we continue our journey backed by a financially strong investor, powered by Hiventures. I want to say a big thank you to all of my colleagues at Automizy and to all of our customers for their patience and support! Stay tuned the best part is yet to come!